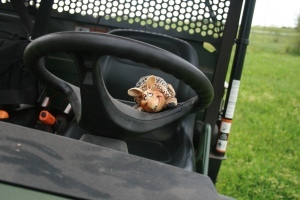 Last week, we left Andy to recover after what should have been an epic sugar hangover. 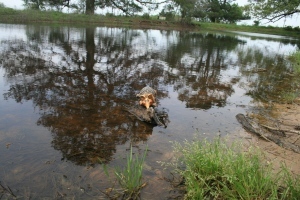 This week, as promised, we get to hear about Andy’s visit to the country, and his encounter with a gator. Please remember to check out the blog of the woman behind Andy’s Texas adventure, Georgette. 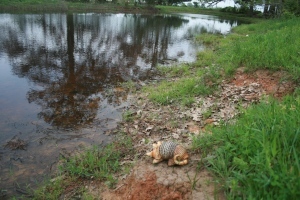 She has countless tales to tell, even without an armadillo: Georgette Sullins’ Blog. 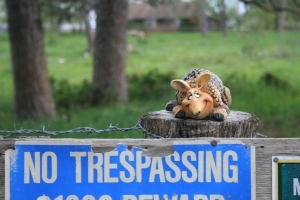 Driving out into the country, we played ‘I Spy’ looking for one of Andy’s cousins. Driving out to the country in Rick’s truck, he let me drive shot gun, as they say in these parts. 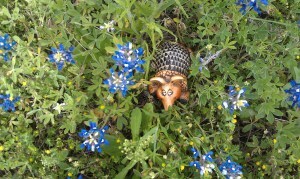 We stopped to nestle among the bluebonnets. Ahhhh…lovely bed. Can I take a nap now? Mama LD gave permission for Andy to play in the mud. I knew he would be happy here while there’s plenty to drink right now. Don’t worry, we’re in a drought. It’s not deep. Rick hired me to patrol. Thanks to my paid gig, my passage to New Zealand is paid for. I’m working my way to see you soon, Judith. We sang “Deep in the Heart of Texas” with Ray Charles on the way home. Do you have a favorite car song? Thank you, Georgette. Based on the last phone call I had from Andy, he is having such a wonderful time. That Andy sure is a talker. I appreciate all the time and energy you and Rick put in to showing Andy an awesome adventure! Again, thank you! And so today, we pack Andy off beyond our shores to Judith in New Zealand. sniff-sniff It’s not the Texas wildflowers that are making us sniff. We will miss him but know a world awaits him. Do contact Lenore to participate in this exchange experience. I know you will miss Andy. Our home seems way too quiet since he left. Don’t be too hard on yourself, K8. You didn’t think of those things, because you were delirious with thoughts of ice skating. And honestly, I cannot thank you enough for shielding Andy’s eyes from his ‘sleeping’ relatives. I know, once I placed him ever so gently in his bed of bubble wrap and sent him on his way to Auntie Georgette, I thought of many, many things I wished I had shown him, most of all, one of our world-class sunsets over the Gulf of Mexico. Perhaps he’ll come back some day – the invitation is always open. Oh my word…sleeping on the pavement. You are too much Auntie Kate (stifling LOL laughter over a not so funny thought). Well Andy is flying economy as I type and should arrive after April 5. First class, hit 3 digits! Looks like Andy had a great time! What a wild ride (especially when it’s such a stretch to reach the pedals)! He wins many fans with his swoony smile and sad eyes. 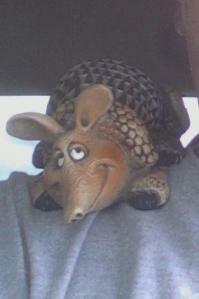 Do not underestimate the power of Andy the Armadillo. Ray Charles, Andy and Lenore. What a party! I know the words…can I join you guys? Well, Georgette at the time .. but I was there in spirit, Amy! (smile) We’d love to have you join us. If you want Andy to visit you, just shoot me an email. 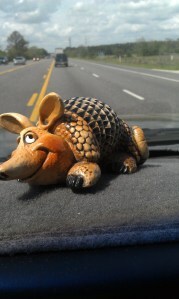 An armadillo driving a gator just seems kind of…wrong. Andy is way more widely traveled than I am! You and me both, Peg. Maybe we should start a “Ship a Blogger” series. Ship a blogger! I want in on that one, too! lol Glad to see Andy is having so much fun! I volunteer to hostess first again!!! If the mailman leaves you on the porch in a box in the Florida sun, though…it won’t be pretty.